Force Friday has finally come and gone. Whether you're into toys, collectibles, games, bobbleheads, costumes or swag, Force Friday was definitely for you! Stores like Target, Walmart and Toys R Us were the popular choice among Midnight Madness releases. For my first stop, I picked Toys R Us. I began my adventure at 9:25 A.M. (some people may think that's WAY too early), but brought a book and stayed entertained all day. As the line began to get increasingly longer, the anticipation kept rising. As I walked in and out of Toys R Us throughout the day, the shelves were bare. Very, very, bare. While waiting in line, it was easy to see the employees setting up store displays and stocking shelves. 12:01 finally hit and we were ushered into the store. The employees handed out free swag including a Kylo Ren exclusive poster and a mini LEGO piece with a First Order image on it. For the most part people we very collected and willing to help other fans get what they needed. The popular items included the action figures (both 6 inch and 3.75 inch), deluxe packs, vehicles and Funko bobbleheads. Micro Machines, LEGO's and 18/31 inch figures were also popular. Toys R Us even had figures of Darth Vader and a First Order Stormtrooper that are called "Battle Buddies". These Battle Buddies are 48 inches tall with a button and motion sensor than can be used for the figure to speak. These mammoth figures retailed at $99.99. Target was also very popular. Target, like Toys R Us, went all out with the decorations. Two First Order Stormtroopers flanked the sliding glass doors as you entered the store. Chewbacca and TIE Fighter displays were also visible and directed people to the Star Wars sections. The "Seasonal area" of Target was all decked out with Star Wars merchandise. They have everything from clothes to bikes to Target exclusives and much more. Target had exclusives of a Kylo Ren Funko and a remote control BB-8 which retails at $80. Walmart did their Midnight Madness very well. They had life-size standees of Kylo Ren and a First Order Stormtrooper, Star Wars themed cupcakes and a table full of free swag. This swag table included: Pamphlets, Rings, Posters, Buttons, Balloons and Galactic Connexions. If you were lucky enough to hit all three stores within a few hours of midnight or in the morning's opening hours, most people were able to walk away with everything they needed. The Disney Store opened at 6 A.M. Friday morning to a line of people waiting outside. Each person who entered was given a card containing a number on it. This number was your number for your limited edition Force Friday pin which came free with any Star Wars purchase. Popular items at this store included: The Elite Series (Die Cast), voice changers, BB-8 plushies, and The Force Awakens play sets. Clothes and supplies for kids were also available there. 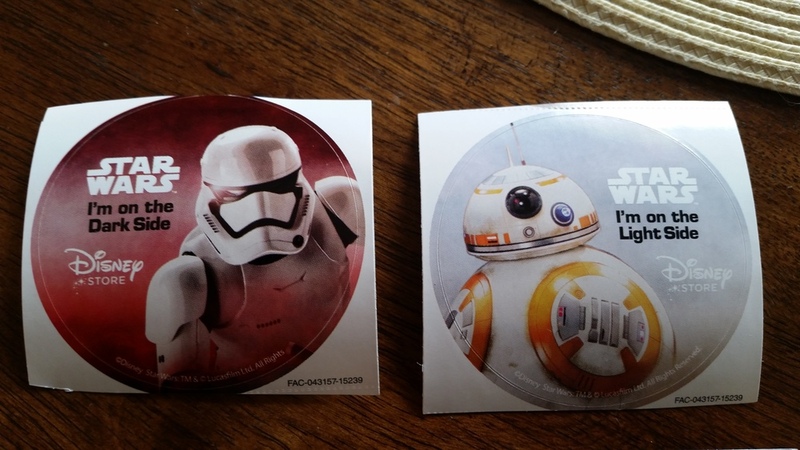 The Disney Store had a Star Wars video playing on their screens and even gave away stickers while supplies lasted. Stores like Hot Topic and GameStop also had exclusive Funko bobbleheads Even Bed, Bath and Beyond had the Sphero BB-8 remote control piece which was displayed in an appealing way. (Don't try to take pictures of it, though. They flip out. I had to learn that the hard way). This BB-8 piece is outstanding and retails at $149.99. It was a very hot commodity among Star Wars fans and most places who carried them sold out fast. All around, it was a very enjoyable and entertaining experience. Standing in line with other Star Wars fans geeking out over the Saga is great fun. I was first in line for the Toys R Us release, proceeded to go to 2 Walmarts that night, woke up early to hit the Disney Store and Hot Topic, made a trip to Bed, Bath and Beyond and finished up at GameStop. Everything I wanted, I was able to get with no problem. If you try hard, you'll get everything you want without a problem. If you were not able to get everything you wanted, make sure to check stores like Sears, Meijer and Costco. Make sure you're patient, too. These figures and toys have only been released for a day and more of them will be hitting the stores in the next few weeks (just be consistent with your store visits).